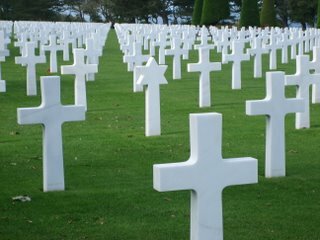 I can't really explain the feeling you get when you walk into the American cemetary on the west coast of Normandy. I've seen "Saving Private Ryan" and I studied WWII in school. Hell, we even visited the museum of the D-Day beaches just before visiting the cemetary. But the numbers don't mean a thing until you're standing among nearly 10,000 gravestones. The magnitude of the markers, and even more so of the names on the markers, is overwhelming to say the least, because unlike other cemetaries, where the inhabitants don't have any significant relation, every one of these men and women died in the war. Within a year or so. And I'll tell you that walking among them and noticing that some were in the same division and infantry... well, you don't need much to get stories going on in your head about who these people were before they were killed. I protested against the war in Iraq and it felt good to exercise my liberty to do so. But there was a rought undercurrent among the protestors, among a lot of the vibes and politics that I've been exposed to over the past 3 years. 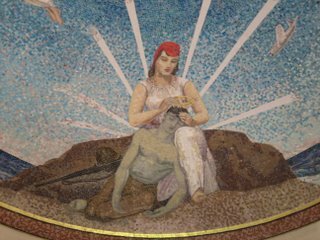 The underlying message, which I have unfairly adopted, was that the military is composed of war-hungry, arrogant pricks. On the other hand, the faces in the newspaper of kids coming home in body bags from Irak and Afghanistan, have never seemed that way to me. And I think it's wrong to confuse the soldiers with their leader, even if there are some of them who aspire to be just like him. 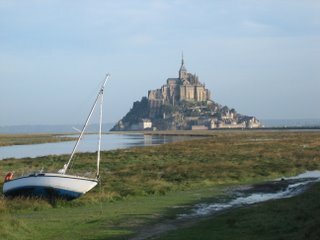 Combine a scientific phenomenon with an abbey that dates back to the middle ages and you've got this tiny island. Visiting the town that climbs and winds along a path up to the abbey was a fantastic way to spend Sunday morning and if I could, I would spend every weekend on a trip like this.